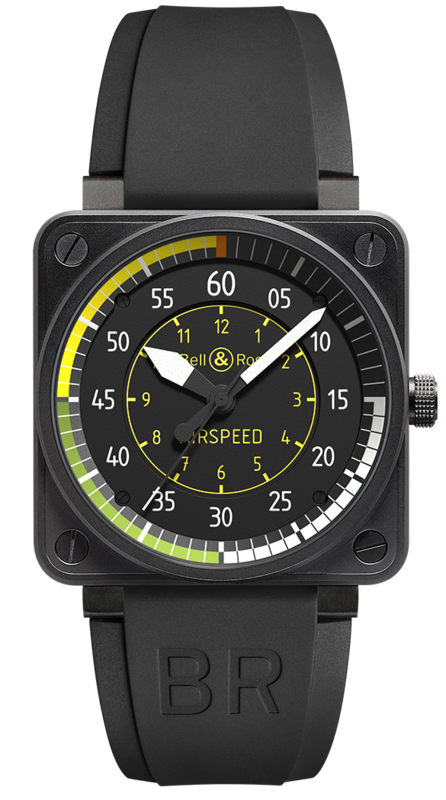 The BR 01 AIRSPEED watch is inspired by aircraft cockpits, where each part is a reference in terms of legibility, reliability and performance. The display of the BR 01 AIRSPEED recalls the graphics of the reference instrument, the anemometer. Case: steel with matte black PVD finish. 46 mm diameter. Screw-in crown. Black dial. Numerals, index and hands covered with a photo-luminescent coating. Black rubber and heavy-duty synthetic fabric straps.